Puppyhood is precious. Every day brings new adventures that help your buddy get to grips with the big wide world. We all want a confident pup who plays it cool and gets along well with other dogs at the park. This is where puppy socialisation comes in: giving your pooch the skills they need to grow into a happy and friendly dog. Puppy socialisation: what are we talking about? The world can be a pretty confusing place for a puppy. For the first few weeks of life, your world consists mostly of you and your siblings – with mum on hand to set the ground rules. But then, things start to get a lot more complicated. Once you’re in your new home, there are suddenly lots of unfamiliar humans, TVs, traffic, cats, other dogs, knocks on the door – not to mention, the dreaded hoover. Who’s your friend? Which things are okay – and what should you run away from or bark at? To get on top of all of this, puppies need a learning process, and we call this process socialisation. Socialisation teaches your puppy how to react to the people and other animals they come across. Hand in hand with this is the process of habituation; whereby your pup learns to get used to what’s happening in their environment. So let’s say a friend pops round for a glass of wine. Habituation helps your dog not to go nuts when the doorbell rings. Socialisation teaches your pup not to terrorise them from the moment they walk in. Ever heard the one about not being able to teach an old dogs new tricks? There’s actually a lot of truth in it. The first three to four months of a pup’s life are precious not just because they’re full of fun and energy – but also because what happens at this stage of life has such a massive impact on their behaviour right through to adulthood. Ignoring socialisation (or going about it in the wrong way) can lead to behavioural problems further down the line. And once in place, these problems can be hard to shift! The Kennel Club found that almost one in five owners are never or rarely in control of their dogs when out walking, and almost half are embarrassed by their behaviour in public! If they haven’t been socialised, dogs are almost twice as likely to be anti-social towards other people and around 25% more likely to be aggressive towards other dogs. Socialisation is one of the most important areas to focus on if you want your puppy to grow into a confident, friendly and happy adult dog. When should I start with puppy socialisation? If you’re adopting a puppy, the socialisation process should already have started well before you arrive on the scene. It’s recommended that pups stay with their mother for the first six weeks of life. It’s thought that at this stage, mum passes on lots of useful ‘life lessons’ to her pups – especially when it comes to interaction with other dogs. 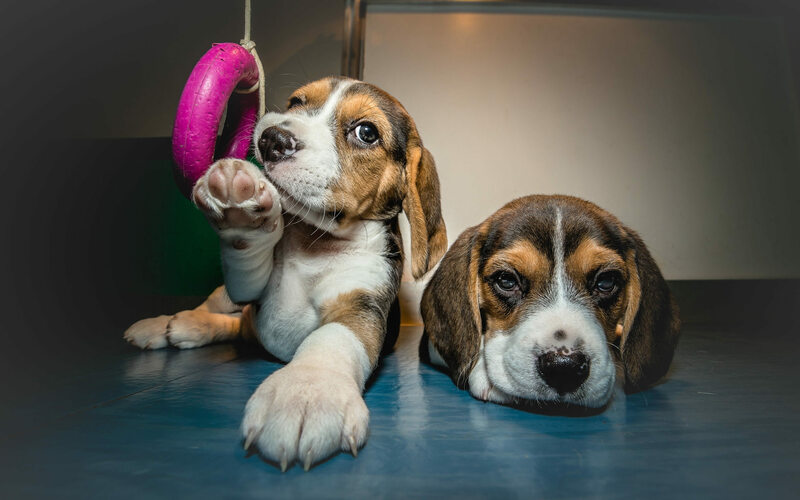 While this is going on, the breeder has a big role to play; this is one of the reasons why it’s so important to choose a reputable breeder – and one who takes socialisation seriously. Have the pups been handled by a range of different people? Have they been exposed to normal household stimuli (like the washing machine, hoover and TV)? It’s worth checking on all of this with the breeder. The next stage of socialisation happens between around six and 16 weeks. This is where you come in. Through exposing your dog to lots of everyday environments, sights and sounds – as well as through controlled interactions with adults, children, dogs and other animals, you can show your dog what’s “normal”. Is there a plan to follow for socialisation? Yes. Experts from Dogs Trust and The Kennel Club have devised a step by step socialisation plan aimed at new puppy owners and breeders. It’s designed to be followed from birth up to 16 weeks and covers everything from meeting new people and dogs, through to getting used to household noise. You can check out the plan here. Do socialisation lessons last forever? Most training happens during those crucial first four months of life. That said, the lessons learned can sometimes wear off unless they’re reinforced as your dog gets older. Take car travel, for instance. Let’s say you’ve followed the Dogs Trust plan and your pup has learned how to take car journeys in their stride. So far, so good; but if you then leave it for a few months (or even years) and then take your buddy out for a spin, it’ll probably come as a bit of a shock to the system. In this example, it’s important to reinforce what was originally learned through semi-regular journeys. Regular vet check-ups are an important part of a young dog’s life. That said, no-one likes being prodded and poked by a stranger – so getting your dog used to things like vet trips and grooming can be one of the most challenging areas of socialisation. Many vets run ‘puppy parties’ to help with this. They’re a chance for young dogs to meet other pups their own age and make friends in a safe environment. Trips to the vet are then much more likely to be associated with “fun” rather than stress. There are usually vets on hand with lots of helpful information and tips, so they’re ideal for new dog owners.